In April 2015, Blogger blog owners first were faced with the requirements of the European Union, and their problem with cookies used by our blogs and websites. Google released the CookieChoices website, and some useful tools which some blog owners used, to add a cookie notice banner, to their blogs. In July 2015, Blogger added a cookie notice banner, to save blog owners the trouble of using the CookieChoices website tools. The Blogger version of CookieChoices is - or could be - transparent to most Blogger blog owners. Not all blog owners really understand the cookie advice notice. This notice, and the Blogger cookie advice banner, goes a long way towards making the CookieChoices cookie advice banner transparently operational, on Blogger blogs. Even so, the Blogger advice still confuses some blog owners. You are responsible for confirming this notice actually works for your blog, and that it displays. 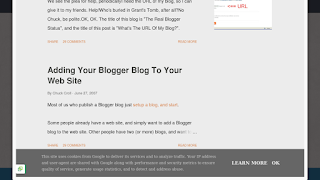 Not all blog owners are sure what that phrase means, nor how to comply with its advice. 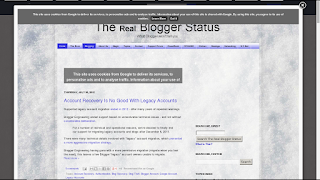 Verifying the cookie notice banner - for standard Blogger blogs - is not difficult. If your blog can be successfully verified, your blog may be compliant. 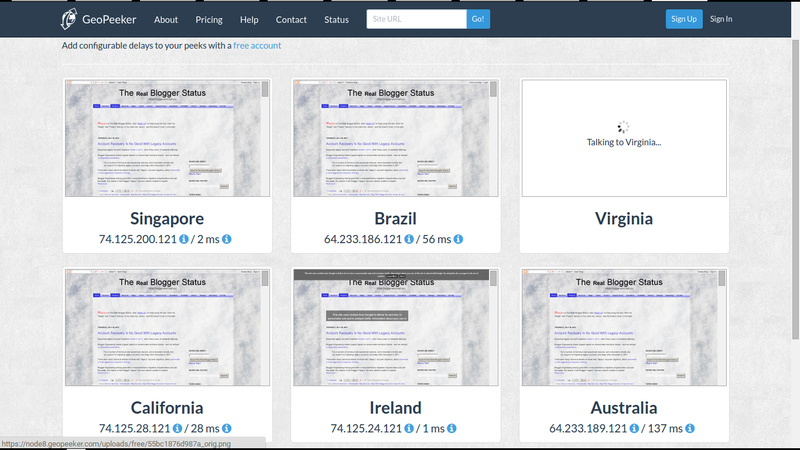 Blogger Engineering suggests use of GeoPeeker, which is a multi-proxy service which shows you any blog or website, using a set of 6 proxy sites. 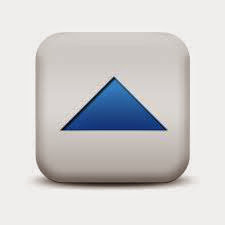 Generally 1 of the 6 proxies, provided in the free GeoPeeker service, will be located in a EU country. Of the above list, you could use either Dublin (Ireland), Frankfurt (Germany), Karlskrona (Sweden), or London (UK) to view your blog and verify cookie compliance, depending upon which locations GeoPeeker provides. 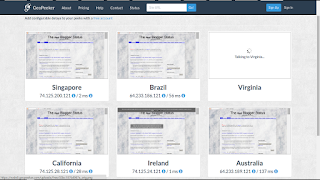 The free version of GeoPeeker gives you a view of your blog, using a set of 6 of the above 12, automatically. This blog, seen in thumbnail view, with 6 of the GeoPeeker proxies. You can click on each thumbnail, to see the blog in full size. This blog, seen by the GeoPeeker Dublin, Ireland proxy. See the cookie notice, at the top? 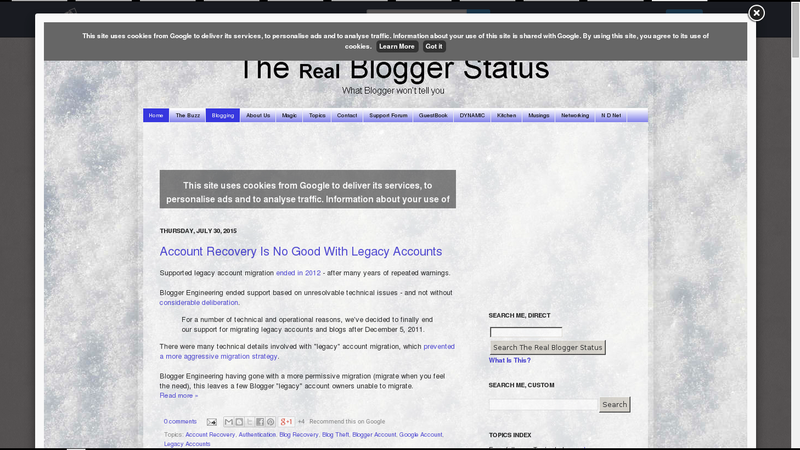 Some blogs, that use a "Responsive" or third party template, may display the cookie notice at the bottom. For those blogs, you'll have to click on the thumbnail for "Ireland" - then scroll to the very bottom of the GeoPeeker full size display, to look for the notice. This blog, now using a Responsive template - with the cookie notice, at the very bottom. Just use either technique, as applicable to your blog. View your blog, and see that it displays the cookie notice. If your blog displays the notice, it may be compliant - so get back to work. If it does not display the notice, more work will be needed. Right now, we'll address the latter, in Blogger Help Forum: Get Help with an Issue. Once you know that the basic banner is operational, spend time researching additional possibilities. I know it's embarrassing, but I still am not quite sure. I have a normal blogspot blog, and the cookie line appears, and I tried changing the country code at the end of my blogs address to other countries (the GeoPeeker didn't work for me), and the notification is there on all of them. So I don't have to do anything, right? Also I pretty much visit the same blogs every day, and even if I did click the OK on all of them, the notification frequently reappears. Do you know why? Since you live in Denmark, you don't need to use GeoPeeker or change the URL, you ARE a EU resident, and you will see the cookie notices - as you noted. If you are clicking on "OK" and the notices keep coming back, you have a cookie filter problem. If the cookie can't be stored on your computer, the script has no way of knowing that you have already been there. At any rate, if you see the cookie notice on your blog (as I do in GeoPeeker), your blog is compliant, and you don't have to do anything. I got a new laptop a week ago, so I'll ask my friend who set it up and moved all my photos etc. from the old one, where I can fix the cookie problem. The way I understand this, if I might have other cookies outside of Google (I have affiliate links to Amazon and places like that). Further action should be taken? Does anyone know? Thanks for the Geopeeker lead, that helped me see what the cookie notification looked like. Anybody who surfs outside Google will have cookies outside Google. It's one reason why I try to recommend "clear cache and cookies" after trying everything else. It's possible to clear cookies selectively - if you know exactly what to clear - but you have to be 100% accurate when you do that. Leave one Google cookie uncleared - or clear one cookie that you shouldn't - and you can hurt yourself worse. So for safety, I just suggest clearing all cookies when you clear cache - and only clear cookies with nothing else to try. Thanks for the response, although I guess I was confusing with what I said. I have a blog through blogger. Since I have monetized my blog with links to other companies that have tracking cookies, do I have to put some other sort of notice besides the one Google already put on my blog in order to comply to the EU law? My understanding is that the Google notice is covering cookies that Google is responsible for. Hmm, that is definitely a different question! the whole EU Cookie issue is not yet well defined, IMHO. Google has defined theirs - because they have a mass of domains - and a mass of cookies, that traverse those domains. Every website has cookies - but not all cookies will have the same privacy implications. But, you should check out what you have. Thanks! It seems everyone is in the same boat with their understanding of it. I appreciate your time! Thank you! I didn't know about GeoPeeker--that was exactly what I needed to verify that my blog is compliant! Thank you very much. You have helped me no end. Thank you for mentioning GeoPeeker! Now, I know the cookie notice is showing on my custom domain blog in the EU. Thank you for mentioning GeoPeeker!